Google Analytics New User Interface: How Has It Changed? GOOGLE ANALYTICS & CONTENT STRATEGY · 6-MINUTE READ · By Tina Arnoldi on August 14 2017. Measuring content performance is about more than who reads a particular piece of content. The ultimate goal is to build a community and ultimately convert people into customers. As a result, using Google Analytics as a content marketer requires analysis in the context of your business goals to truly be strategic. Google Analytics provides direction so you can Improve on what works and stop what does not work to create better content in the future. But ultimately Google Analytics only measures and content marketers need to tweak and analyze the data to inform content strategy. Moving them from one step of the journey to the next includes measuring what people do with your content that matters to your business and is done through the creation of goals. Although basic engagement metrics are helpful to know, you want to go beyond that to determine what people do right after they engage with your content. The journey is a GPS for understanding your customers. With blogs, it’s not uncommon for people to leave after reading a post, especially if the referral source sent them to a specific link. Although behavioral goals are somewhat vague, they indicate the success of the content. Below are several goals to consider for a content site. Do visitors complete goals when they are referred from one channel compared to other? Which sites are key to growing your business as indicated by the number of people to your content pages who are engaged? To be sure you have an accurate picture of sources, there are some situations where you will want to use channel groupings. Most sites will need to do at least some spring cleaning with Google Analytics Channel Groupings. For example, domains lumped into the referral category could include an additional domain that you own or your email software. With referrals from owned media, you might see a significant number of conversions for that group. A first glance at referrals as a whole may lead you to believe that much of the marketing budget should be allocated here because of the ROI. But when you drill in, you may discover domains that should be bundled into an “owned traffic” grouping to separate them from genuine referral sources. With a clean referral source, you have a more accurate picture of who is interested in your content and how many natural backlinks you are building. 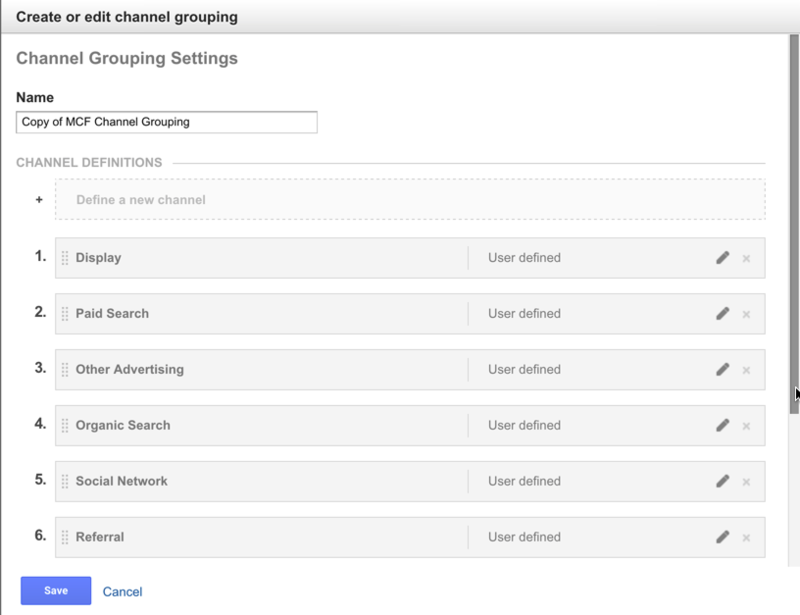 To organize this, go into the Admin section of Google Analytics to your Channel settings where you will see the existing channel groupings. With the existing Referral channel, choose to exclude domains that should not be included because they are domains that you own. You still want to record that data, just not as a referral. Decide the grouping that makes sense for your business and include it in a different category. Note that this is not retroactive, it only applies to future traffic but gives more accurate data. This is a perfect example of how Google labels data and the need for marketers to interpret it and tweak Google Analytics to better inform strategy. Content grouping is used to organize a site into identified segments and aggregate data accordingly. You can see if a specific theme moves visitors along the journey more than the other themes. Like channel grouping, marketers need to understand the data and how to report on it for a specific business. There is no one way to do content grouping – it is based on how you want to report out. A common example of content grouping is to organize blog posts by categories, such as analytics. 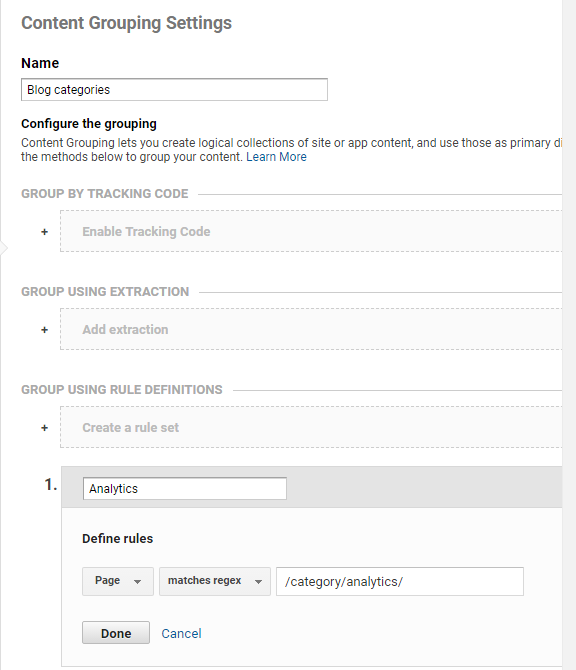 To do this, you could create a rule set indicating that pages ending with /blog/categories/analytics should be placed in the content grouping for analytics. Do this step for each applicable segment for the blog categories. In this example, you might include posts with categories of /googleanalytics or /supermetrics in your larger content grouping of analytics so you can determine audience interest on topics related to measurement. Once this is set-up, you can see performance by your content grouping in Behavior > All Pages which indicates how content performs on a topical level. You now have a high level overview in addition to the detail. Long form content: Visitors taking time to engage with white papers imply a stronger interest than people who only view your 200 word blog posts. Visual: People watching videos or signing up for webinars indicates how many people prefer visual content versus text only content. Pre-purchase pages: This could measure the different possibilities for people who are closer to making a purchase, such as signing up for a demo or requesting a call-back. Once you understand the theme on your site, you can create more content that keeps visitors engaged rather than leaving the site. Still uncertain about how to set up content grouping? This short clip from LovesData might help. There are a number of templates from Supermetrics that help you monitor the channels that bring people to your website, with options for slicing and dicing your content. Implement some of the suggestions above and decide in advance what people should do with your content. Remember: You don’t care about content – you care about using content to be better at your business.